This is an American Art Deco period advertising poster for a performance by the magician George. 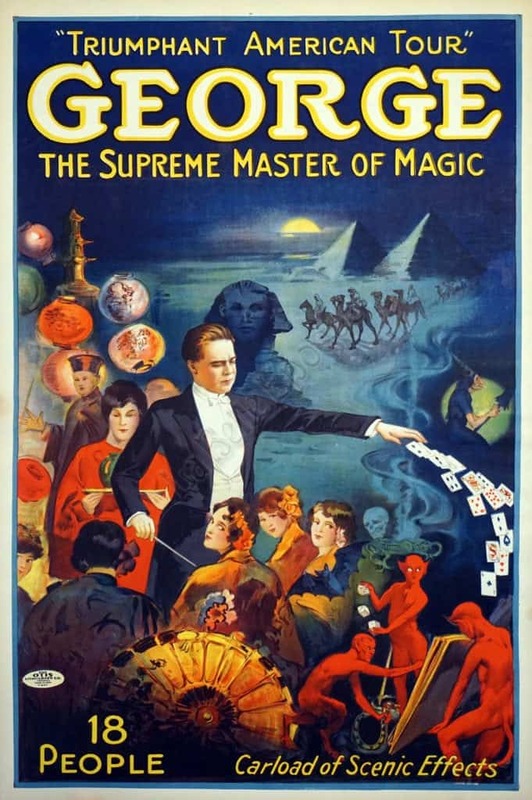 Framing the central images of the poster is bright yellow typography, on the top it says: “‘Triumphant American Tour’ – George – The Supreme Master of Magic,” and on the bottom, “18 People; Carload of Scenic Effects”. The central image shows glimpses of the bizarre and exotic places and people seen in this magic show. George stands in the middle of these small, brightly colored scenes, elegantly dressed in a tuxedo, holding a wand and sending out a stream of cards from his hands. This vintage poster is an exquisite and impressive ode to the theatrical art of the magician that was so popular at the beginning of the twentieth century. This original magic poster was printed by The Otis Lithograph Co. Cleveland, 1920s.